Frost Valley YMCA recently received the Character Development Learning Institute grant, which was used in part to bring in respected youth and parenting expert Deborah Gilboa, M.D. to teach the camp staff about resiliency and character development. 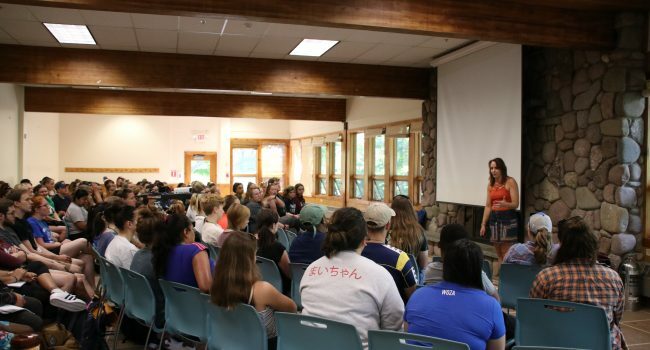 Staff from Frost Valley’s day, overnight, and equestrian camp programs attending the character development training were inspired by Dr. G’s tips for helping campers to develop respect, responsibility, and resilience. 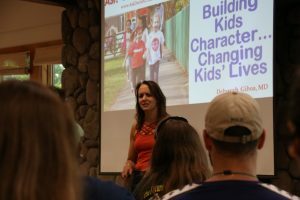 She highlighted the impact that camp counselors have in children’s lives. Dr. G discussed how to give children the opportunity to problem solve on their own, how to show campers empathy without intervening in every situation, and how to build self-esteem by complimenting children on their efforts rather than their personality traits or possessions. Dr. Gilboa, popularly known as Dr. G, is a board certified attending family physician. She is also the founder of AskDoctorG.com, a renowned author and public speaker, and the mother of four boys. She inspires audiences with relatable stories and easy-to-use techniques for helping children develop crucial life skills. “We were ecstatic to have Dr. G speak to our camp staff. This training was a vital part of a much larger blueprint for staff development and programming at Frost Valley, which is designed to foster in our campers those non-academic skills that will enable them to thrive in school, work and life,” said Jessie Emmons, Community Programs Director of Frost Valley YMCA.